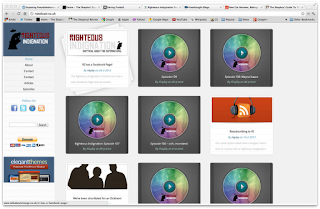 I am planning to migrate this blog to a new host, and I plan to a modest revamp of the site design. I have recently taken an interest viewing websites I visit regularly for inspiration and for choices to avoid. With this in mind I have taken a few screen captures with my thoughts on the webpage. I have viewed the sites using various devices: a 20" iMac running Chrome, my iPhone 4, and my iPad (3rd gen.). If things look terribly different on an Android tablet or Windows Phone 7 smartphone, I would be surprised. It does make a difference on how well a site works from one device to the next, and a few site probably ought to take this into greater consideration especially given the growing popularity of mobile web browsing. 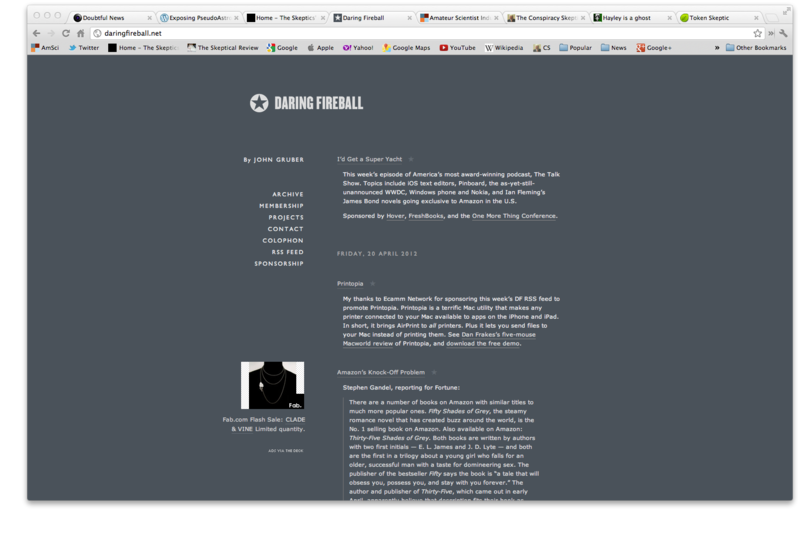 Daring Fireball is a favorite website. 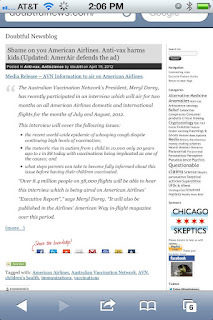 The site is not a skeptical website, but a tech website run by John Gruber. He specializes in following Apple. 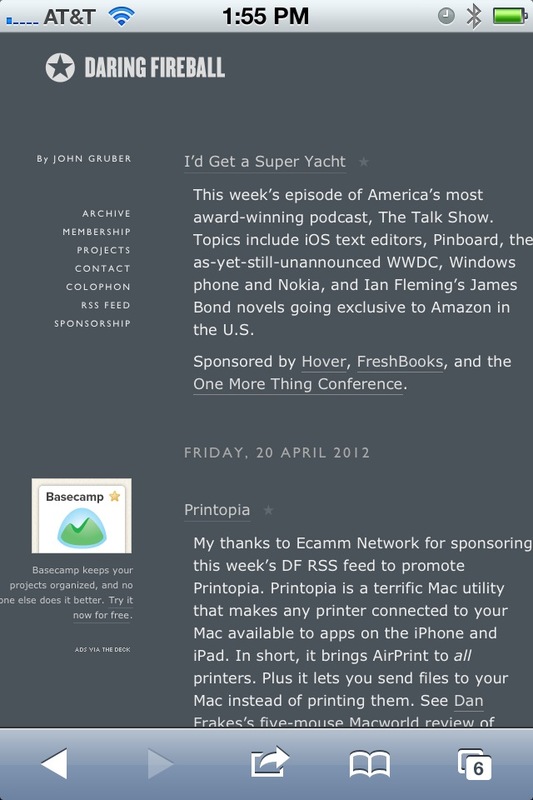 Daring Fireball is a nice elegant site, which while simple at first glance Gruber must have sweated the details to make it look so clean much like the Apple products Mr. Gruber finds so appealing. Gruber has coded the site himself. I think it shows. The header doubles as a link to the original article which is above a brief blurb from the quoted article followed by Gruber's commentary, and no comment section. Simple. Pleasing. Although the lack of a comment section limits the feedback with the reader. I experimented with the removal of the comment section on my site, but decided this became eerily quiet. 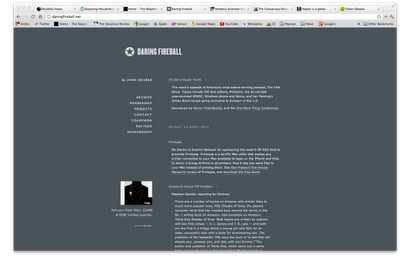 The lack of a comment section might work for a tech focused site, but for a skeptical blog it is nearly a must have. I recall Gruber discussing on The Talk Show how he sweated each pixel of his star logo. You can tell. Although in the font size of the site on an iPhone sized screen is a bit on the small side, and without a retina screen pinch and zoom is must, and with a retina screen your eyeglass prescription must be up to date. 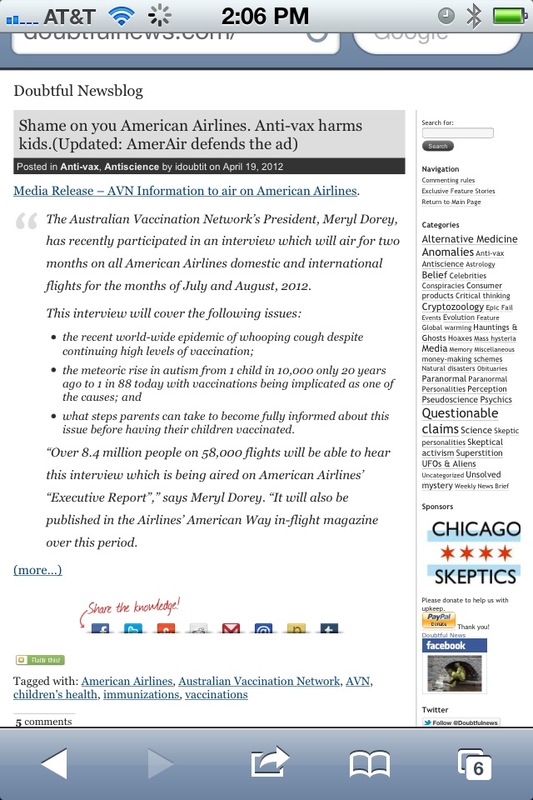 A skeptical website with a similar set up of a headline, links, quotes from the a featured article along with the readers commentary is the excellent Doubtful News. 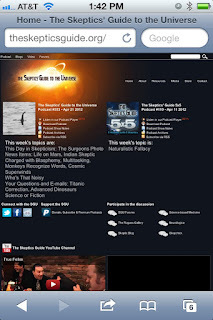 The site has a fairly efficient design, and is easily to navigate on a desktop or iPad. The multiple columns convey a lot of information in a easy to scan manner. The webmaster of the site, Sharon Hill, has done a smart thing and altered the site for mobile users making everything single column for the smaller smartphone screen. However, the small font size for a smartphone makes it a bit of a challenge for easy reading. 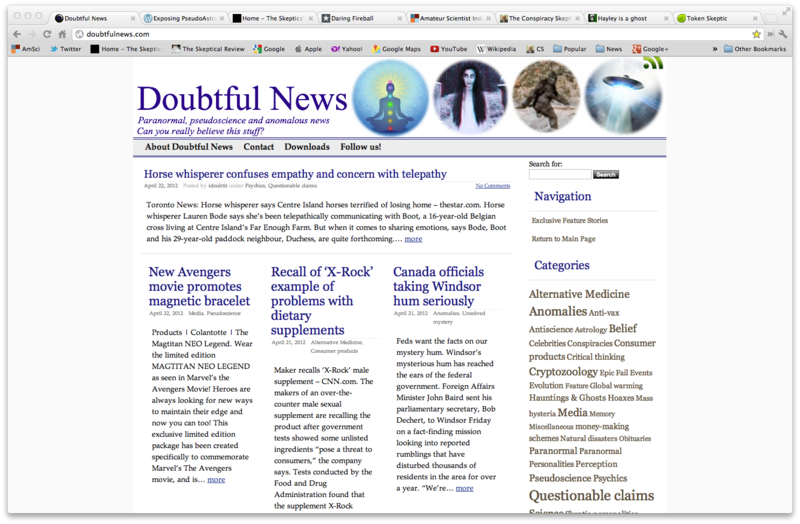 As a side topic beyond the site's design, is that Doubtful News is simply a fantastic site for skeptics. It lays out the most interesting news items of the day usually consisting of questionable paranormal, or irrational stories punctuated with Hill's pithy commentary. A bookmark for this site on your browser of choice is a must. 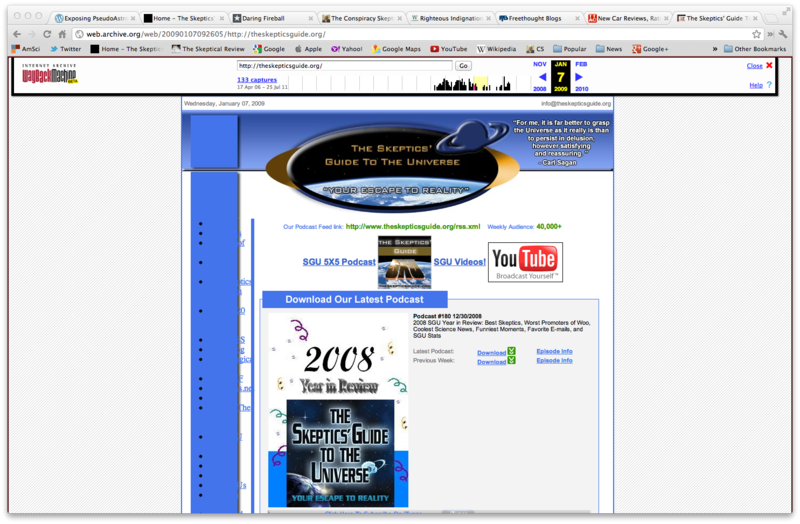 One site that I think requires an overhaul is the grand mothership of the skeptical podcasting world The Skeptics' Guide to the Universe. There just seems to be stuff going on all over the place. 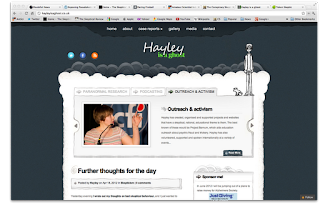 I remember a few years ago in 2009 when the site was revamped, the new site design ( looked slick and much better than the original design as preserved on the left from the Way Back Machine. However, the current design is starting to show its age compared to some newer websites, and the Rogues have never done a mobile version. All the small links and buttons are a pain to access on your smartphone requiring the performing some serious pinch and zooming. 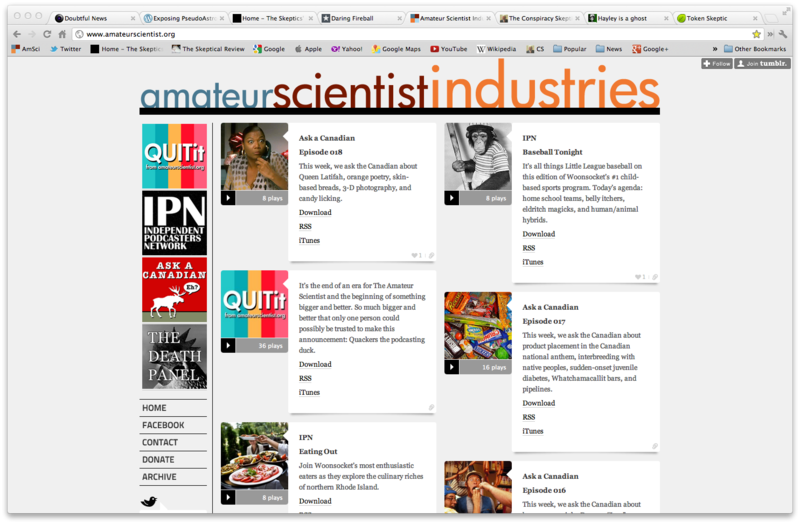 In comparison the Amateur Scientist Industries website is clearly inspired by the latest in website design. Amateur Scientist Industries a superior design. AmSci contains nice big "Metro" style block graphics. It is more elegant design, and is more intuitive to navigate. Brian Thompson and/or whoever designed this site did a nice job. Nice. Where did the links at the disappear? Another website that is quite pleasing to the eye, and still easy to navigate is Hayley Stevens' blog Hayley is a Ghost. 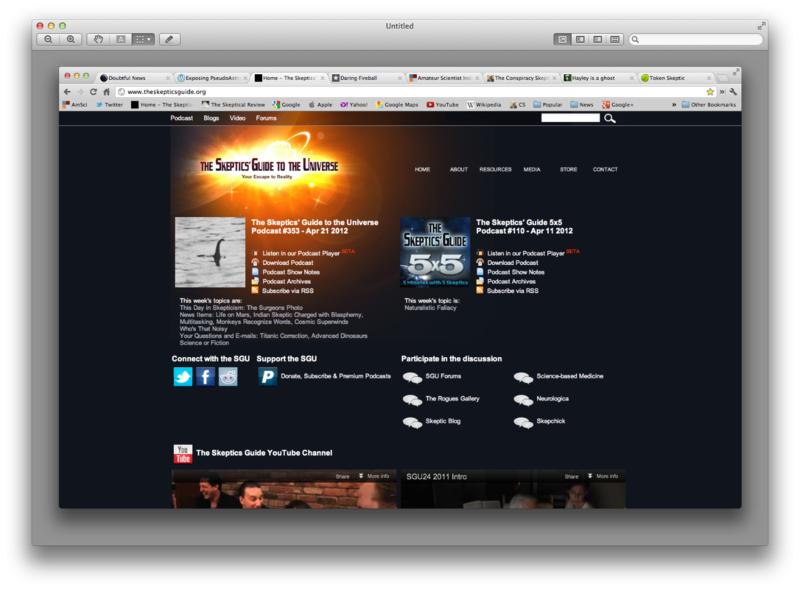 Above is the iPad version of her site. It is easy to navigate on a tablet as well as on a traditional desktop or laptop. The only issue with the site is that the header links can get lost as noted between the top iPad screen shot and the desktop screen shot below it. Also, big blocky designed sites are not always so swell. 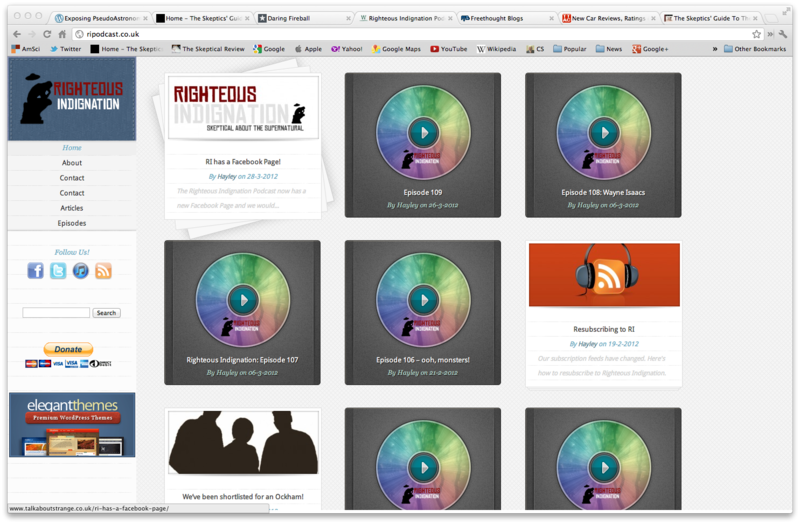 The redesigned Righteous Indignation website while dead simple to use, contains no 'eye candy.' All this is subjective, but RI's website could use a little T.LC. So, in the end what does all this reveal? After all SGU's mobile experience is quite unpleasant but despite mobile being the big area of growth with smartphones, iPads, and Kindle Fires springing up dandelions, the SGU has yet to address this market. Yes, much of what I have noted is very subjective. However, I do think websites designed with the smaller screen of the smartphone or at least a sister mobile site for skeptical blogs and podcasts is clearly a smart way to go. (One could also down the iOS or Android app route, but that is a whole different kettle of fish.) 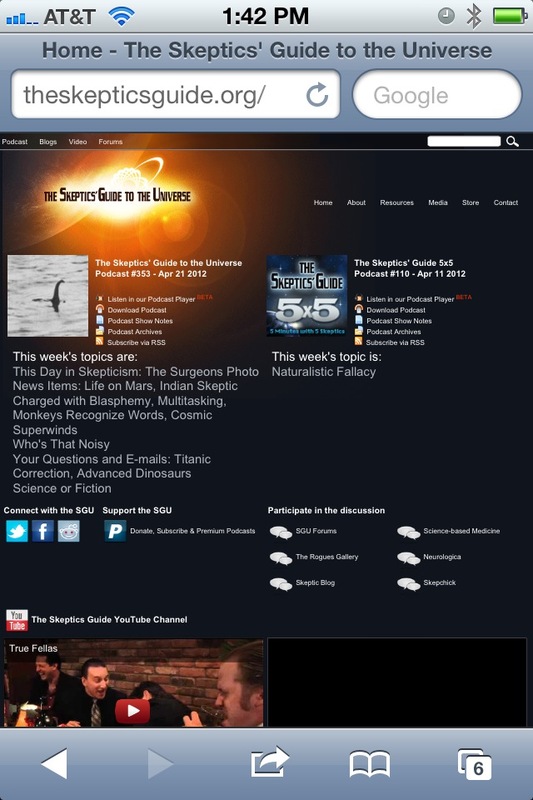 If I had to pick my favorite two skeptical website designs overall I would have to pick Amateur Scientist Industries and Doubtful News. They pack a lot of information in a easy to navigate site, although Doubtful News could use some tweaking for mobile use. I beseech the Rogues to do something to make the Guide's site easier to use on a smartphone. It is time for a revamp. In the end, the content of the site is king. However, the ease of use and pleasantry of the experience should be taken into account. This being noted, once I redo this website, it'll likely not live up to anything I have written above. While I am opining on the subjective, it just struck me how much I love the Token Skeptic's logo. I do not know who did it, but they ought to be commended. It's some nice work. 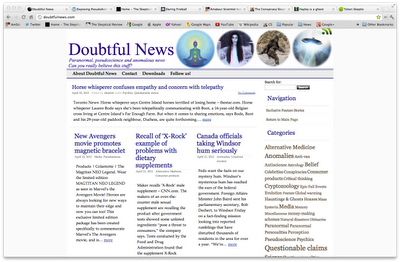 I'd go "Doubtful News" myself. IMHO - many of us rarely check out sites on phones unless it's a reference emergency ("Google Maps, now!") 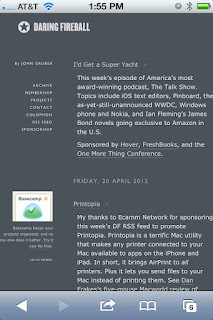 and I generally browse through your site on Google Reader (where it's just the RSS) or via the site itself. I agree with the point about "content is king". The logo? I actually won that in a bid, when there was fundraising for The Boom Effect! The former-wife of a podcaster died, leaving him to raise his daughter alone. The podcasting community rallied together to get a bunch of things that could help with the future education of the child and I was quick on the draw to get a custom-logo by Alex White of http://studiosixguns.com. He's done work for other podcasters, including http://www.thegearheart.com and Pippa Ballentine (at http://www.pjballantine.com). I've since commissioned a few other logos, which I've put on t-shirts, et al, but that one has always remained a firm fave.